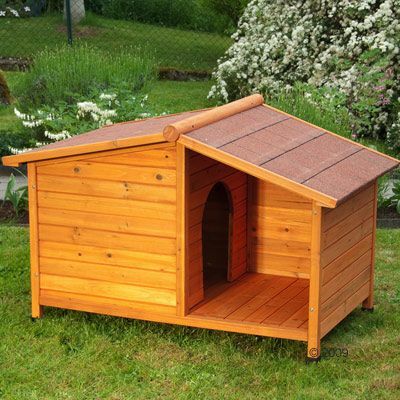 This sturdy and attractive outdoor dog kennel features a pitched roof & a sheltered patio, making for a special, protective home for your pet. Easy to assemble and made from pre-oiled spruce wood. Perfect :"Bought this as a Christmas present for our stray cat who had been using a cramped rabbit hutch to sleep in. 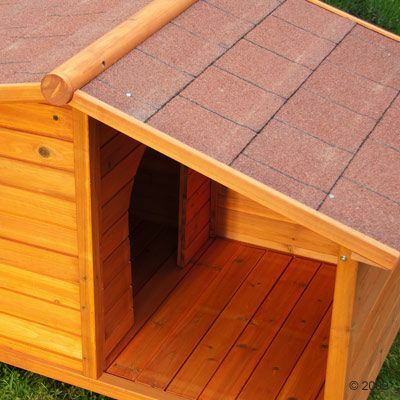 Ummed and ahhed about buying the small or large but the small is perfect.The bed area is big"
The generously oiled fir wood makes Dog Kennel Spike Special an excellent weather & winter proof home. The sheltered patio provides protection from rain and wind, while offering a nice and cool shadow on sunny days. Your dog can thus enjoy more fresh air during the summer. 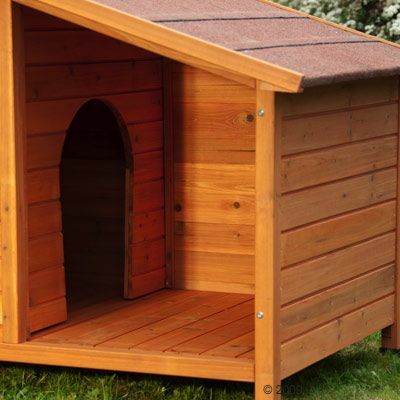 It's the perfect 4-season dog shelter with a roof overhang and a bottom clearance (8.5 cm) to protect your dog from the wet ground while helping your kennel last longer. 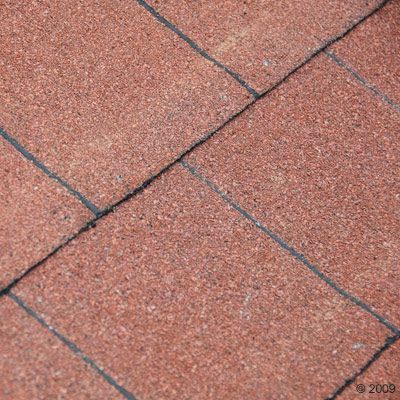 The roof is made from specially treated material for that extra weather proofing. 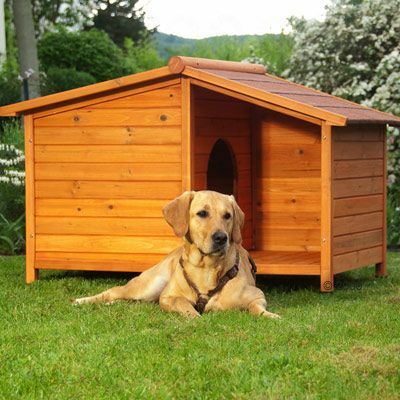 An Additional Plus: Assemble this kennel easily with only a few screws. Attention: Your dog kennel should never be too big for your dog - meaning if your dog's own body heat is not sufficient to maintain a warm temperature inside, a smaller kennel is recommended to prevent your pet from freezing. Tip: To make your dog feel at home, place a blanket inside the kennel. Please note: Without treatment, timber will dry out and can become brittle, warped or shabby. Please ensure your pet home is regularly cleaned and treated. We recommend treating dens and houses which will be used outside with wood care and impregnating products. Always make sure products used are suitable and harmless for pets. Placing the pet home in a sheltered spot will also help to reduce wear. This product cannot be delivered to Northern Ireland. Bought this as a Christmas present for our stray cat who had been using a cramped rabbit hutch to sleep in. Ummed and ahhed about buying the small or large but the small is perfect.The bed area is big enough for his medium sized heated pad to go in so he's warm, dry and happy. Easy to assemble and sturdy when complete. Well worth the money. Thank you for a great dog house. It was delivered fast in good condition. It assembled easy and quick, you made a great choice to use bolts and nuts instead of screws. It's provide enough Covered inside and outside room. Good quality of product with left right exit options. There are crack in the wood, not critical but worth to mention. All in all fair price for delivered 30 kg. Box. As an improvement I would be absolutely happy if the roof was made as removable option for easy cleaning. Bought this for our stray cat! We’ve adopted him but he likes outside living. Painted and carpeted inside, purchased a bed for inside too. It’s snug, dry and warm for him. He’s a big cat so room to move and also a section to leave food out. Very happy with this kennel. I bought the small size to give the local city fox(es) and/or the stray cats a place to rest and retreat. I think it is a bit small for the foxes though a very young one will fit. I’m happy with the house and will get another, the next size up, and hopefully both cats and foxes then have a house each. I love it! I bought the small for two stray cats I feed as, when the weather's bad, I hate to see them sleeping rough. I don't think either has used it yet but the thought's there.... I also bought the insulation pads for a slightly larger kennel-this one doesn't have additional insulation-and it took me longer to take the insulation apart, cut it to shape, and fit it into the kennel, than it took me to put the kennel together! Still, I think it's worth it. Easy to put together. Looks nice. EWasy to put together and beautiful. this is an outdoor house for my cats when they need it. It also looks low maintenance! I am really content with my purchase. Great, sturdy product. Assembled in a few minutes, extremely easy and intuitive assembly. I would recommend to give it at least one hand of clear exterior varnish to protect the wood from the weather. It almost doesn't look like it has been treated, if you ask me. It came with a small damage on the roof, but Customer Care resolved the question in a matter of 3 hours: a 40% refund. Great! A very good experience with Zooplus. I would recommend it to others. I bought two of these kennels for feral cats living outside. Unfortunately, one kennel had become damaged in transit, but ZooPlus helped to sort everything out. 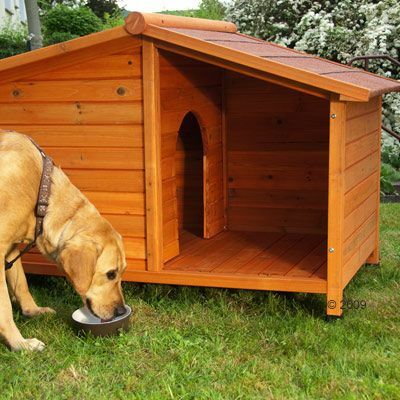 These kennels are brilliant, and the small ones are just perfect for outdoor cats. The kennel was easy to fix together, about 30 minutes taking my time. All I needed was pozidrive screwdrivers of two different sizes. 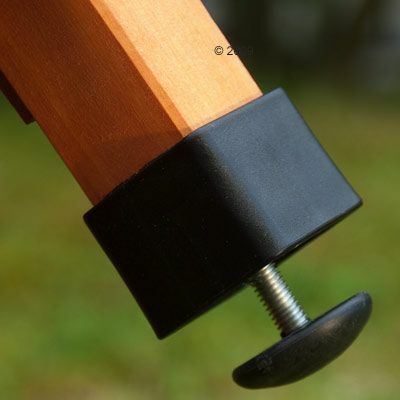 The wood is slightly soft so be careful when screwing the bolts up, as they need to be tight, but not over-tight where they could damage the wood. The small kennel had 2 floor pieces, even though the instructions said there were 3 floor pieces. So the instructions are wrong as there is definitely only 2 floor pieces to fit into the small kennel. The kennel is quite heavy and very sturdy, suitable for bad weather and strong winds. It is weatherproof with bitumen tiles on the roof to stop the rain getting in. There are some slight gaps in the floor between the wood pieces, but we covered the floor with small carpet tiles for the cats. The feet are screwed in and can freely turn, which means each foot can be turned if the kennel is on an uneven surface. Overall, this is a brilliant kennel and I wished I had bought it sooner. My cat loves the enclosed sleeping section, plus the open porch area for food bowls but is still protected from the bad weather. He will often sit in the open porch watching out. Really pleased with purchase. This is the 2nd kennel I've bought from here for my cats. Delivery was fast, arrived in perfect condition and took about 10 minutes to put together, very straight forward. I bought the small one and I'm surprised how big it is. Bought this for a stray cat I have befriended. Do not hesitate in buying this product. I ordered it on Tuesday and it arrived on the Friday. All pieces were present and I put it together in about half hour (only my 2nd flat pack assembly in my life). It is sturdy and is perfect for what I need it for - and puss cat is delighted with it too! 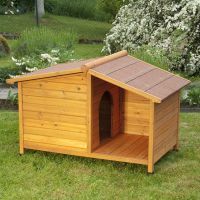 I have 3 indoor cats who only have access to an enclosed garden, so I purchased this kennel along with the cat lodge house, so that they have somewhere to sit, hide and play all year round. The kennel itself is very well made and my husband put it together very quickly with no problems, he too is impressed with it. It's great because it has a little patio at the side, so keeps all the bad weather out of the kennel. It not only provides them with a place to be on their own if they want but it will also keep them warm, dry and cosy, which is what I wanted. I bought this for my cats and it arrived on Saturday, looking at it the instructions were very limited, but when I started to build it, it was so easy, only took about half an hour! Well worth the money and would recommend it to anyone! Although this is sold as a small dog kennel, my cats just love it. It sits at the top of the garden under the trees and has become their outdoor home providing shelter from rain and sun. The product is well designed, the quality is excellent and it fits together in a matter of minutes. No cat owner should be without one! Excellent kennel, quick and easy to build and perfect for our windy hill top location, puppy loves it already! We bought this kennel for a homeless cat in our garden. Arrived quickly but the box was split open as the items inside were very heavy. Very clear instructions and it took me (I'm a woman) 30min to assemble it without any help. It was much bigger that we thought! Bedding stayed dry in very heavy rain. Received the kennel in good time however it was the wrong one! (no wall on the side of the verandah). Not too impressed but didn't want the hassle of having to return it so assembled it anyway. The part with the arched entranceway does not fit well with the surrounding wood and there's a gap which I've had to fill. It rained pretty heavily the past couple of days and I checked inside and the bedding remained dry, so at least that's going for it. All in all, this product is satisfactory, but not perfect. I would probably buy elsewhere next time. We bought a spike special a few months ago for Milly. it was very easily assembled & all the parts arrived. In fact i have just forwarded your latest offer to a friend who was admiring it & will be purchasing one soon. Well..the good points- easy one man assembly. the bad- it arrived with a part boken ( tho not surprising coming from zooplus) Much smaller than antisipated, not best quality, but it'll do for now. But we've learnt from our mistake, next time. fork out the money for quality.